The pursuit of details is… relentless. The bicycle frame itself is beautiful, and yet the custom frame offers boundless options for individual expression, but what really makes it truly personal is deep in the details. On my bikes I'm always tinkering with the finest details and smallest bits - never satisfied. Earlier this year I got a message from Dan at Kustom Caps asking if I was interested in checking out some of their custom laser etched caps. It was one of those right messages at the right time kind of deals. I had been saying to the shop that they really should be sending their custom builds out the door with a branded top cap. I had seen the Kustom Caps feed on Instagram and that's what sparked the idea, however, I just hadn't gotten around to doing anything about it. Then opportunity presented itself. Dan and I did a bit of back and forth to finalize the design for a top cap and matching bar end plugs which I would check out. I also bought a dozen top caps for the shop as a thank you. All black of course! Turn around was pretty quick and if I recall correctly, the caps and plugs were out the door and on the way to me. Since they had to cross the boarder to reach me here in Toronto, it took about a week to arrive, which is pretty standard for anything originating from the US - Kustom Caps are made in Cleveland, Ohio. In the plastic envelope I found the 13 caps and two bar end plugs all securely delivered in bubble wrap. Each top cap is contained within its own little plastic pouch and the bar end plugs were paired in a small plastic baggie. Kustom Caps offers a couple choices in the top cap shapes. There is the traditional sloping style and the more modern flat cap.. which are both available in a variety of anodized colours. And they compliment these with matching anodized stem cap bolts, cause why customize the cap and then use a stock grey bolt? The various caps and bolts are all made from 6061 aluminum through a CNC (computer numeric control) machining process. That means they start with a solid block of aluminum and then mill away the excess until the final piece is left. The stock or custom graphic designs are then laser etched in. They are always going to be white graphics as the laster etches off the anodizing to reveal the natural aluminum below. In my opinion, the graphics look best on dark colours because of the greater contrast. I also think that the flat cap looks better on modern frames, so I ordered those. Plus I'm sure the flat cap makes me way faster because aero is everything (that's a joke btw.) The Kustom Caps website says the caps weigh 9 grams but mine came in at 7. I suspected this was because the claimed weight is based on the traditional sloping style cap, so I checked a Radavist top cap I have (it says Kustom Caps on the bottom) and it came in at 9 grams, suspicion confirmed. If you're asking yourself "Won't a custom aluminum cap add more grams to my bike?" The answer is probably no. For comparison sake I weighed an ENVE carbon top cap I have and that was 8 grams so it's a net trade. To complete the weigh in I checked the matching anodized black stem cap bolt and that came in at 3 grams for a total combined weight of 10 grams on the set. 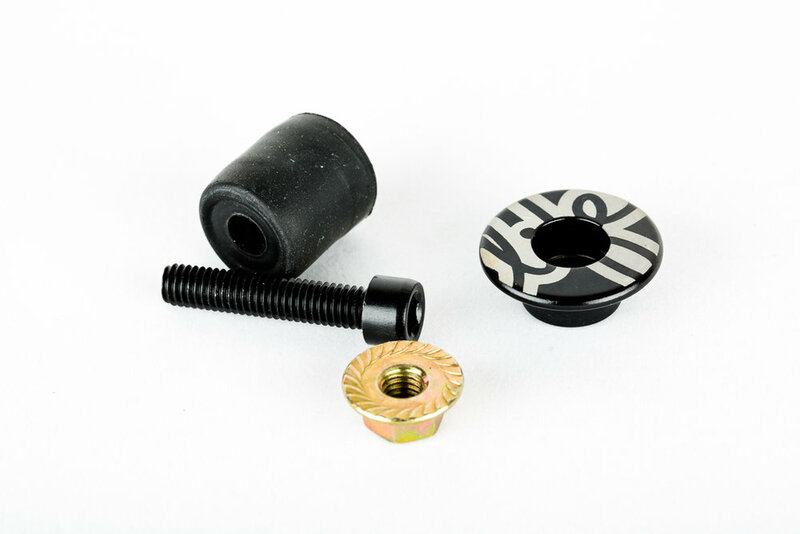 Like the top caps, the bar end plugs come in a variety of anodized colours and matching anodized bolts. The laser etching creates a white, almost grey'ish, graphic as the laser exposes the natural 6061 aluminum underneath. Installation of both the top cap and the bar end plugs is pretty straight forward. The top cap is installed in the exact same way any normal top cap is and there is no call for any special tools. Just a 5mm Allen wrench - although I always recommend a torque wrench when you're messing with your bike. Mounting the bar end plugs is slightly different than a tap in plastic plug but still simple enough. After wrapping your bars as normal, pre-assemble the 4 pieces of the bar end plug so that the compression rubber is just small enough to slide in while making sure the bar tape is nicely wrapped around the bar end. Once you've got the graphic lined up the way you want it, tighten the bolt until it has a snug fit. Bar end plugs are purely cosmetic so it doesn't need to be any tighter than what is required to hold your bar tape in without falling out. That's it. A small bit of gear to trick out your pride and joy. It's one of those little things that adds a lot of special personality and comes at a low price. Since the graphics are custom, the only real limit is your imagination. But remember that the scale is small, therefore you don't have a lot of space for super detailed images. If you check out the Kustom Caps site you can see some examples of what is possible via their stock designs. They offer individual or bulk order pricing depending on if you want to make your own or share with friends.